Our custom embroidery is undertaken by local company Stitch Station who have many years embroidery experience. Using thier top of the range, Tajima Neo embroidery machine they can offer stunning embroidery for your business, club or organisation at a very competitive rate. Turnaround is quick and quality assured. Stitch Station pride themselves on offering the best custom embroidery service in the area - if you can get a needle through it, they can embroider it! They can embroider logos, badges, monograms, in fact anything to do with personalising your organisation's image, onto almost anything you can imagine. They can embroider a huge variety of items including tee-shirts, sweat shirts, towels, bags and caps - they can even embroider your football boots! 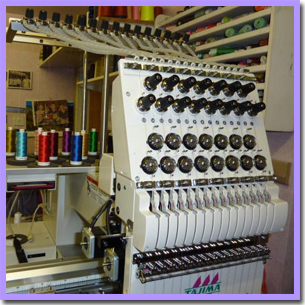 If you require embroidery of any kind, please contact us for a no-obligation, free quote.